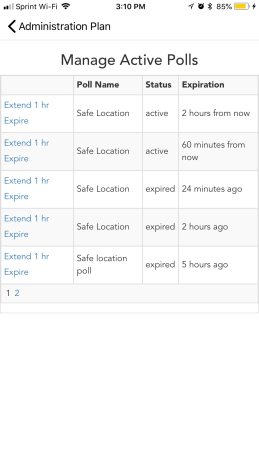 You can view and access Poll Results from both the Safety Center Administrator Portal and the Safety Center Mobile App. 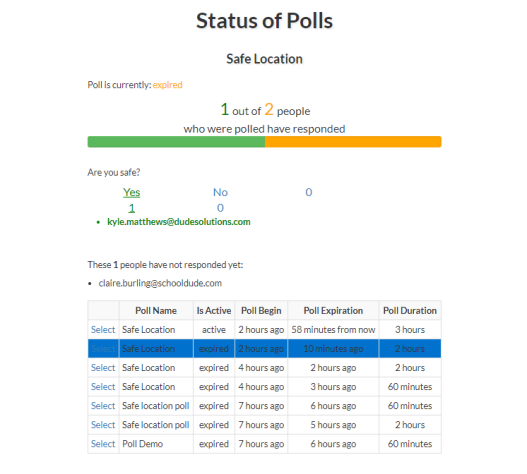 Select Poll Status from the drop down menu. Click the Select button next to the Poll you want to view results for. Click on the answers of the Poll's questions to see who responded and how they answered. You can also view the list of users that have not responded yet to the poll. You are able to view Poll Results and manage a Poll from within the Mobile App if you have added the appropriate events to the plan. Open your plan and select the event for viewing Poll Results. Open your plan and select the event for managing a Poll. Click Extend to give an active Poll another hour. Click Expire to immediately end an active Poll.